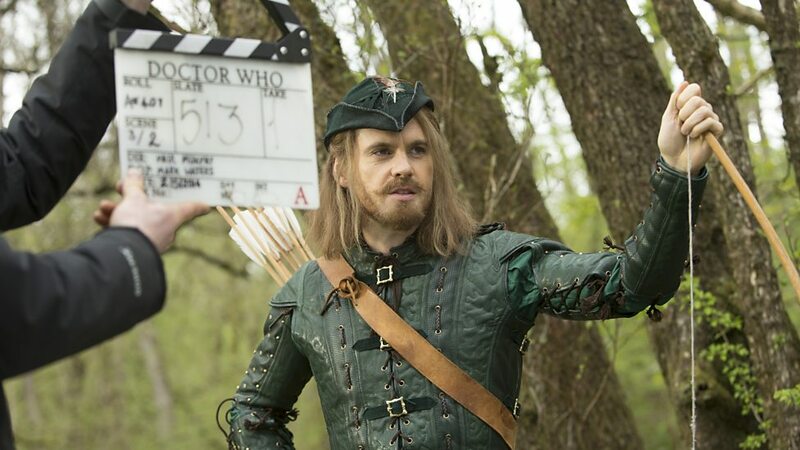 Legend, fiction and Robot of Sherwood (2013) | Randomwhoness: a Doctor Who blog by Johnny Spandrell. Sampling stories in random order. Clara Oswald was born, we’re led to believe, on 23 November 1986 (making her birth story The Ultimate Foe, fact fans). And a story she’s always loved, ever since she was little is Robin Hood (I think you mean since she was young, she’s always been little, I can hear Beverly Hofstadter from The Big Bang Theory saying). But which version of the story, did she love I wonder? We know she’s a bookworm, so she may well have had the Big Book of Robin Hood, or whatever it was. But I think, like most children of the 80s, she would have been watching those merry men on TV or at the cinema. She’s just that little bit too young to have seen ITV’s hit series Robin of Sherwood, though perhaps she rented it from the video store when she was older. We didn’t get it out in Australia (as far as I know), but from all accounts, it was the goods: thrilling, enchanting and romantic. All this plus Jondar too. It ran for three seasons and has garnered its own devoted following, and is obviously fondly enough remembered to have an episode of Doctor Who named after it. All in all, it’s a pity Clara wouldn’t have seen it. But perhaps as a precocious young five year old, she was able to enjoy the bumper Robin Hood year which was 1991. Two major Hoody feature films! One – Robin Hood – was the brooding, serious type with Patrick Bergin. That was the one no-one saw. The one everyone saw was Robin Hood: Prince of Thieves with Kevin Costner and Mary Elizabeth Mastrantonio. It was inescapable, not least of all because it had a saccharine ballad by Bryan Adams on its soundtrack which was played on ultra high rotation on commercial radio. It conquered the box office and, it has been claimed, was influenced by Robin of Sherwood (and Who stuntman Terry Walsh worked on both apparently). But it’s surely the Costner swashbuckler that Clara’s parents took her to the cinema to see. Then, I imagine, she watched it multiple times on VHS until the tape snapped and she wailed until her parents bought her a new copy. And she sang (Everything I do) I do it for you at her school concert. I can see it now. Robin Hood: Prince of Thieves is exactly the sought of rollicking popcorn flick that Robot of Sherwood is striving to be. Lots of action, lots of romance and with plenty of arch self awareness. I mean when you have a band of merry men consisting of Costner, Christian Slater and Morgan Freemen, it’s clearly not shooting for verisimilitude. Enter Alan Rickman’s sneering, petulant Sheriff of Nottingham, who turns it up to 11. “Cancel Christmas!”, he demands at one point, a gag which has lasted so long it made it into A Christmas Carol. All this plus King Yrcanos and Gilbert M too. It is, to invoke that much used Who-ish term, a romp. Just like Robot of Sherwood. By the time she’s 19, I imagine Clara’s spending her Saturday nights out socialising, so perhaps she set the tape for Robin Hood, the Tiger Aspect TV series which ran on BBC. It also fits the established template; action, romance and a dash of post-modern humour. Jonas Armstrong was a particularly hipster kind of Robin, it was generally good, clean, occasionally anachronistic fun. All this plus Son of Mine too. Robin Hood kicked off in 2006, and was, at least in part, a reaction to the successful revamp of Doctor Who. Clearly there was a big enough market for Saturday evening adventures for family viewing to accommodate both. It’s also a reason why new Who has taken so long to get around to a Robin Hood episode (though to be fair, not as long as the original series, which never got there at all). It would have been odd to have two versions of the story on air at once. But it would have been the perfect excuse for a cross over episode. I wonder if it was ever mooted? A Christmas special perhaps? Why is all this significant? (Well, it’s not really, these are random thoughts after all) But there’s a famous moment in Robot of Sherwood which reminds us that Robin is as much a filmic/televisual hero as a mythic one. It’s that moment where a computer screen is flashing up a variety of representations of Robin from literature and folk law. Among it is a photo from the BBC’s original TV adaptation of the story, Robin Hood, from 1953. It’s telling that the Robin chosen for that shot is not Jason Connery or Jonas Armstrong or even Kevin Costner. Of course, it’s second Doctor Patrick Troughton, and that cleverly feeds into a key theme of the story, that the Doctor and Robin are similar creatures. That photo of Troughton positions Robin as an echo of the Doctor himself. Later on, there’s some pleasing post-modern chicanery when the Doctor, a fictional character, disputes Robin’s very existence. “I’m as real as you are,” Robin tells the Doctor at the story’s end, which is to acknowledge that both of them are unreal. Both are works of fiction and the stuff of legend. And from whom did the Doctor (bony rascal Peter Capaldi) learn to sword fight? Richard the Lionheart! (a real person, much mythologised) Cyrano de Bergerac! (a real person, fictionalised for the stage) Errol Flynn! (An actor, famous for playing Robin Hood). So a confusion of historical figures immortalised by legend, historical figures enmeshed in fiction and an actor who pretends to be other people. It’s all very fitting for a sword fight between two fictional characters arguing about who’s real. But there might have been a more amusing version. Who taught you to fence, Doctor? Terry Walsh! Patrick Troughton! That fox from the Disney film! LINK to Warriors of the Deep. Soggy Doctors. NEXT TIME… Enlightenment brings whatever one desires. So that’s good news. Ah yes, the one where everyone lives happily ever after for about six months till they die horribly from cancers induced by the background radiation which the script conveniently neglects is still there. Am I the only one that had a real problem with this ending? I hadn’t picked this up! Oops. Bad news for those formerly merry men.